Zinc One Reports High-Grade Zinc Results From Surface Samples at Bongara Zinc Mine Project | Energy and Gold Ltd.
Vancouver, British Columbia–(Newsfile Corp. – November 1, 2017) – Zinc One Resources Inc. (TSXV: Z) (OTC Pink: ZZOF) (FSE: RH33) (“Zinc One”) is pleased to report results from an ongoing surface-sampling program at its Bongará Zinc Mine Project in north-central Peru. 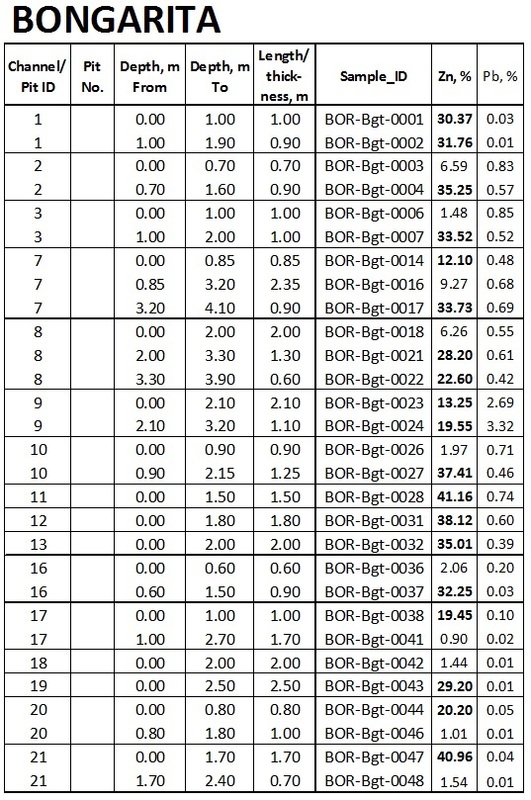 Highest grades include a surface channel sample (#38) with 47.73% zinc over 8.1 metres from a dolomite, a surface channel sample (#72) that yielded 25.65% zinc over 19.7 metres from a dolomite breccia, and 32.50% zinc over a 3.8-metre depth from a dolomite breccia in an exploration pit (#425). Additional sampling will continue in these areas and then will move on to the Mina Grande area, specifically Fase B and Fase C.
Zinc One anticipates the approval of its submitted application for 130 drill platforms and expects the drill program to commence shortly thereafter. The planned program includes drillholes throughout Mina Grande, Mina Chica, and Bongarita areas. A map of the proposed program is available on Zinc One’s website at https://zincone.com/projects/bongara-project/bongarita-mina-chica-samples/. The Bongará nonsulfide zinc mineralization is stratabound and is hosted by carbonate rocks. Field mapping and observations indicate the mineralization is essentially flat-lying across an anticlinal axis at Bongarita and dips approximately 60o eastward along the flank of the anticline at Mina Chica. Of note is that neither area was drilled and although a few pits encountered the footwall of the mineralization, most of the pits have not penetrated the footwall. 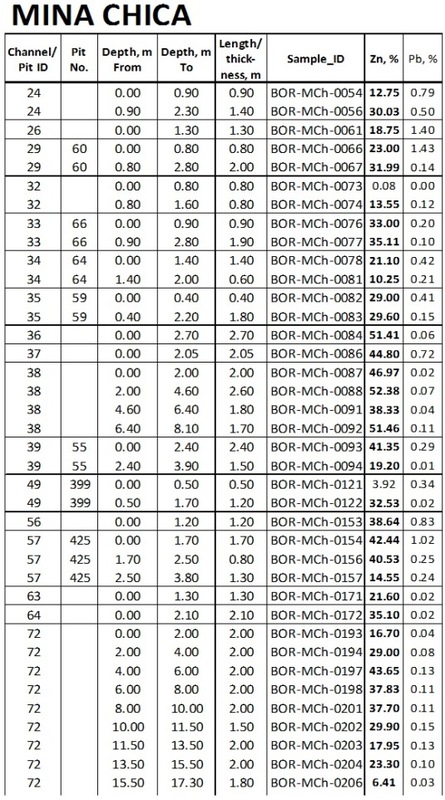 Since the true strike and dip are not certain, the sample thicknesses from the pits do not represent the true thickness of the mineralized body, which at Mina Chica apparently lies along the slope of the topography in a tabular configuration. The tables below highlight select results from Bongarita and Mina Chica. Additional maps and a summary of all results are available at https://zincone.com/projects/bongara-project/bongarita-mina-chica-samples/. Zinc One is focused on the acquisition, exploration and development of prospective and advanced zinc projects in mining-friendly jurisdictions. Zinc One’s key assets are the Bongará Mine and Charlotte-Bongará Zinc-Oxide Projects in north-central Peru. The Bongará Zinc-Oxide Mine Project was in production from 2007 to 2008, but shut down due to the global financial crisis and concurrent decrease in the zinc price. Past production included 20% zinc grades and recoveries over 90% from surface and near-surface nonsulfide zinc mineralization. High-grade nonsulfide zinc mineralization is known to outcrop between the mined area and the Charlotte-Bongará Zinc-Oxide Project, which is nearly six kilometres to the NNW and where past drilling intercepted various near-surface zones with high-grade zinc. Zinc One is managed by a proven team of exploration geologists and engineers who have previously constructed and operated successful mining operations.